The worldwide refugee crisis is a complex issue with no easy answers. It is hard to imagine what it feels like for a child to arrive on a foreign shore hungry, wet, exhausted… Or what it is like for the parents taking such a risk in hopes of giving their children a brighter future. Robert and Robin Jones’ book, The Refugee Crisis, thru the eyes of children, gives us a glimpse of what this looks like – particularly through the eyes of innocent children. Robert and Robin Jones from Southern California have lived on and off in Lesbos, a Greek island near Turkey, for 42 years. In 2015 they found themselves involved in a growing crisis – the arrival of boatloads of refugees coming to Lesbos to flee war and start a new life. The Jones watched as weary families came ashore, often with nothing more than the clothes on their backs. Children were cold and hungry, and parents were confused—yet hopeful. Since they had not died on the seas, maybe they would find a new life after all. But their story does not end there. In spite of mixed feelings about how to handle this increasing influx of refugees, it did not take long for the generous people of Lesbos to pitch in and do their part to take care of these people as best they could. Some gave bread, others water, others a ride up the road (although the registering center was still much further and required a lot of walking). Robert and Robin Jones witnessed the generosity of the Greek people as well as the endless work of volunteers and aids groups. They found themselves also doing their part to help and were particularly drawn to the children with their intense innocence and vulnerability. Robin initiated a stress-relieving activity for the children as they gathered waiting for their bus to the registration center. She placed a checkered tablecloth on the ground with colored markers and papers and invited the children to draw (giving the exhausted parents a much-needed reprieve). She captures their art in the book The Refugee Crisis, thru the eyes of children—and it is deeply moving. The children seemed to find joyful distraction in coloring. All drew some kind of body of blue, the sea that had brought them to this island. Some sketched tanks on one shore and trees on the opposite shore. Each colorful drawing recorded a story – a child’s perception of his flight from wartime. The Refugee Crisis: Through the Eyes of Children recounts an eye-opening story that will surely touch any heart. The pictures are delightful (of course – children created them!) and portray the daunting and desperate adventure of crossing water in hopes of finding a safe haven. Robin’s photos bring life to Robert’s compelling narrative. However, tighter editing could have improved the flow and eliminated annoying writing/typing errors. Still, this is a rich read. JD–The story of the work among the refugees is compelling. Have you been able to follow up with any of those you helped? If so, can you tell us what happened to them? RJ – Thousands of people were on the move during the time of the book. There was really no thought of staying in touch as most only had dreams of reaching somewhere they knew very little about. It was a time of escape and we were merely a part of the flow. Countries were building fences to keep them out and movement was the great driver. We have wished many times we had taken the opportunity to look towards future follow up but it was not the time, it was a time of helping in the moment. The few names we do have, we have not been able to locate. JD–As founder of Orphans First, I work with impoverished, at-risk children in several countries and it is amazing how they express themselves through their art. Can you tell us what surprised you—or touched you—most about the children’s artwork? 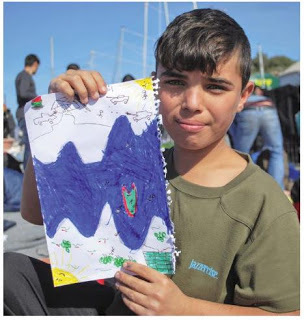 RJ—All of the artwork in the book was done by the children within 3-4 hours of making the dangerous crossing by raft from the Turkish mainland. Although exhausted, dis-oriented and in incredibly strange surroundings, given a chance to be a child for a moment, we were amazed at the way the children fell into the fun of expression. The drawings tell frightening stories but were at the same time filled with hope and new beginnings. JD–Have you returned to Molyvos recently? How does it look? Do you still see the orange vests? RJ—Molyvos is our second home. We live there three to six months per year, for the past 42 years. There is a lull in the arrivals and the island and village have had time to take a breather. We are experiencing under 100 per day on the island, a far cry from the 3000 arrivals a day during the height of the crisis. The beaches are pristine, and the village is open and inviting. We hold our breath for the coming summer and hope the mass movements of prior summers will not suddenly reappear. The children’s art as well as Robin’s photographs can be viewed here.